Golf umbrellas are not just for the golf links but for all types of outdoor activities in fair weather and sunny climate. Choose golf umbrellas with vented technology that will keep the users cool in the sultry weather all the while making the umbrellas steadfast against the strong winds and protect them from the risks of inversion. There are even UV resistant canopy fabrics that will keep the recipients safe. From ultra light to compact models to sturdy and heavy models and everything in between, there are a lot of interesting models to consider. 64 Inch Arc manual Open Golf Umbrellas: These auto open golf umbrellas have a simple manual operation. Offered in various brilliant colors, these umbrellas are well suited for golfing vacations, hikes or tours around town. Your brand and message on these will get a lot of attention for sure. 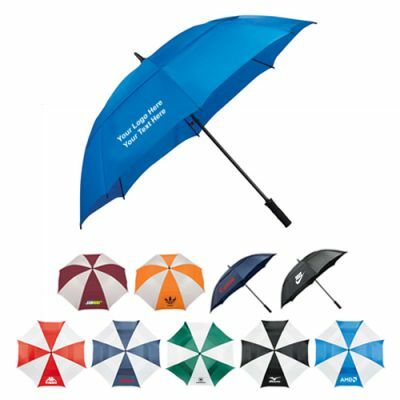 These umbrellas also have the added advantage of UV silver coating SPF 50+ canopy that will keep the heads cool and offer a great canvas for printing your brand information. Your recipients will carry your brand wherever they go and set off word of mouth publicity as well. Equipped with a polyester fabric with fiberglass wind resistant frame and a black rubberized handle, these manual open umbrellas will have a long innings and will make your brand stand out. 58 inch Arc Golf Logo Umbrellas : Available in no-nonsense black color, this 58” arc umbrellas offer impressive coverage for up to two people. 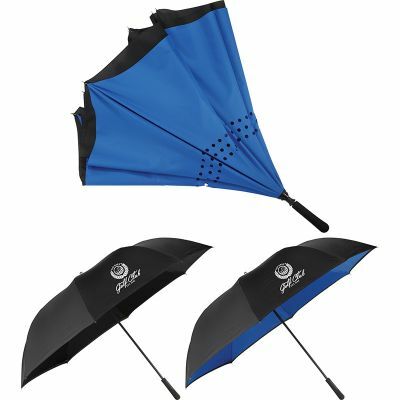 The polyester canopy and fiberglass ribs, make these umbrellas light weight and sturdy alike while the black foam handle makes it easy to carry these around. Well suited for golf tournaments and fund raising events, these golf umbrellas will make heads turn in the greens and beyond. 62 Inch Arc Vented Golf Course Umbrellas: Budget friendly and incredibly popular, these attractive golf umbrellas with a double color panel design will grab a few eyeballs during golf events. These manual open, full –vented golf umbrellas have a fiberglass construction that makes it lightening resistant and wind resistant, which is an added bonus. Big enough to hold two people at a time, these umbrellas will ensure assured ROI for businesses. If you are looking for a reliable way to get your message across at easy rates, look no further than these golf umbrellas. 58 Inch Inversion Manual Golf Umbrellas made of durable pongee material, this innovative inverted folding design will allow opening and closing in inside-out directions, thus making it easy to keep the water contained and the outer surfaces dry while opening and closing. When closed, these custom golf umbrellas can stand on its own and drain out the water contained. Push button pinch-proof runner and dual layer pongee canopy are also highlights of these custom printed gifts. 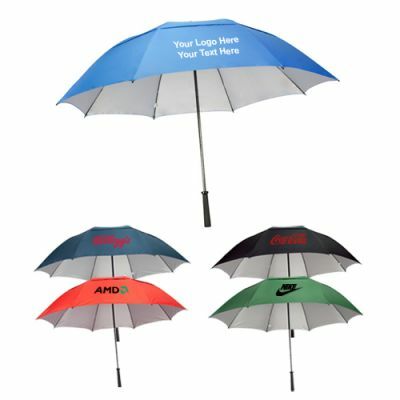 Which of these custom golf umbrellas will tick the boxes of your promotional items? Share your thoughts with us at our comments below.